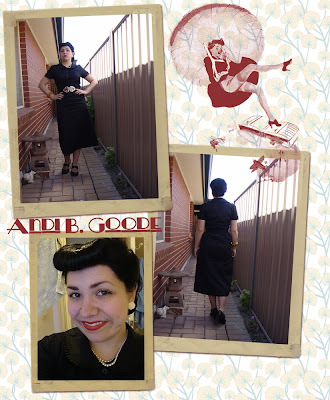 Outfit details: dress - Salvo's; stockings - Love Kylie; bracelet - etsy; shoes - Spendless. A woman in one of my classes said she really liked this outfit because she thought it was more of a 'modern' take on the vintage thing. I was thoroughly upset by that. I'm not sure if she meant 'Modern' (like Modernism) or modern meaning up-to-date, though. Outfit details: dress - vintage via Salvo's; bracelet - etsy; stockings - Love Kylie; shoes - Spendless. This dress is from the 1970s but I thought it was kind of 1930s-ish. What do you all think? I really like the print. The second dress definitely has a late 1930s early 1940s feel about. Lovely rolled bangs, can you buy hair rats in Aussie? I'm absolutely in love with the print on the second dress - perfect for summer. Reminds me of something you'd see in a Tiki bar, perhaps. I love both your dresses! And the print of the second one is so unique. I always look forward to seeing which dress you will show us next, i thought i had a lot of dresses...until i met you :) dresses are deffinately my favourite article of clothing. You look great! 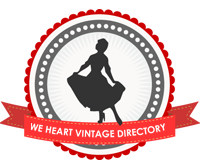 I love your hairdos and decidedly vintage style. I'd have said early 40s for the dress! I always am a little puzzled at the "modern" comment too--I've gotten it a lot when I'm wearing things I wouldn't consider modern! lol. Who knows?! Anyway, I really love the second dress. I agree with you--it definitely has a 30s/40s feel to it, even if it is later! I recently thrifted a similar dress (only brighter colors) from the 80s. I have to admit: if I can't afford/find/commandeer a dress from the 40s in that style, I'd rather do with a close approximation from a later decade! ;) lol! Very 30s! I love it on you! love that second dress!! It's definitely got that Pearl Harbour Honey look to it! wow, that printed dress is amazing and it looks great on you! Gorgeous! I love that you found those dresses at Salvos, they're such great finds! I love your hair too. 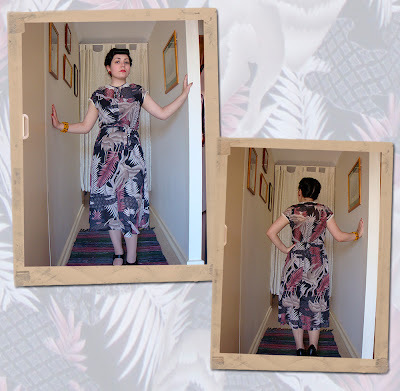 I think the second dress is '30s length with a gorgeous 40s-ish kinda print! Rosina: Thanks, love. =D And you sure can. Miss Emmi: Thanks so much. =] Yes, I thought of something tiki, too! Rose: Hehe, thank-you! I'm so glad to hear that. Madeleine Miranda: Thanks. =] Yes...early 40s is probably more like it. Angel: Thanks. =D I love it! Amanda: Thanks. I'm a bit in love with it. esme and the lane way: Thank-you! =D Yeah, I love the Salvo's. when you say stockings do you mean stockings that are held up by suspenders (or hold ups?) or actual tights? Both dresses are wonderful. I adore your beautiful rolled bangs so much! thanks Andi. Was just wondering how devoted you were as suspenders can be a bit faffy though I've recently discovered there can be sturdy ones available! Last time I wore mine it nearly fell down!